This sounds like your cursor jumped outside the text entry box, and then when you hit backspace your browser did a "go back one page". If that's what happened, then you could have recovered just by doing a "go forward one page" to get back to the one with the text box on it, still holding your previously typed text. When I started the new post I caught the cursor when it jumped up and deleted the ) after (alt+0 above the text box. I had tried to go forward before but had to started over. I mis-typed 33. Should be 30. I thought I had read in one of the follow-up links on the forum that the BE were more for student stereoscopes. I've been going around so much I can't find where I got that from, But I see that you used a CFI BE for the horsefly blowup and I can't see any possible improvement on that! So either one at 4X would be good for my beginning foray and current project. Then I just need an adaptor and some kind of focusing system. I know the camera focusing isn't precise enough. I was looking at this post Nikon CFI 10X Plan Achromat on Canon 100 mm macro lens, giving 5X. Is that because that lens is only going to 1/2, not lifesize like my 200mm macro? And does tube lens just refer to such lenses as these. I hadn't seen them called that in other situations. Here is a large beetle that I took with the primitive macro setup I have been using so far. I guess it didn't appear. Is that because that lens is only going to 1/2, not lifesize like my 200mm macro? The reason for 5X versus 10X is that infinity objectives deliver actual magnification in proportion to the length of the lens they are used with. For most objectives, including Nikon and Mitutoyo, rated magnification happens when used with 200 mm. So when I use it with a 100mm, I only get half the rated magnification. However, such a setup retains the original NA (numerical aperture), which means that optically you get the same resolution on subject. That turns a nominally 10X objective into an extremely sharp 5X. And does tube lens just refer to such lenses as these. I hadn't seen them called that in other situations. The term "tube lens" is borrowed from microscopes. In the beginning microscopes used "finite" objectives that worked by themselves shining light down an empty tube to form the real image that the eyepiece magnifies for viewing. Then microscope designers split up their systems into an "infinity" objective whose output consists of bundles of parallel light rays, plus a new lens that converges those parallel rays to form a real image. The new lens was positioned at the bottom of what used to be the empty tube, so it was called the "tube lens". When using an infinity objective in front of a long lens mounted on camera, the long lens serves the same optical function as the microscope's tube lens. That's why I often write something like "using an ordinary telephoto lens as a tube lens". See the detailed instructions at http://www.photomacrography.net/forum/viewtopic.php?t=7. Also it would be best to start a new thread ("topic") to show your own images. Inserting them into a FAQ thread is getting too far afield. So would you recommend this, based I what I use? I figured using with a Nikon D4, and Nikon 200mm F4 AF macro lens. If I used a 10x instead, with a Nikon 60mm AF macro for a similar size result, is that not as good an idea? In either case, what adaptor would be needed? Yes, this will work OK. That combination of lenses will give actual 4X onto the sensor. The D4 has a 36mm x 24mm sensor, so this will give you a frame size on subject of 9mm x 6mm. Coverage of the full frame sensor should be uniform if you remove the black hood from the objective. That definitely will not work. You would be looking at an actual magnification of 3X (10*60/200), giving a frame size on subject of 12mm x 8 mm. There are no 10X objectives that cover nearly that wide of a field, so you would get severe vignetting. The CFI BE objective has an RMS thread, so you would get an RMS-to-52mm adapter such as HERE, plus a step ring to go between 52mm and whatever filter thread your 200 mm lens needs (62 mm for yours?). I ordered the first 2 items and almost ordered a step up ring by mistake, when I realized I need a step down ring, 62-52. B&H has some more expensive ones. In these sizes, filter threads only come in one pitch. There should be no problem with fit. I have never purchased expensive step rings. The cheap ones have always worked fine for me. and this is what they sent me! This is actually the CFI BE objective you ordered (with RMS 20.2mm thread), but you're right about the image not matching the objective for sale, because it has the more expensive CFI 60 (not BE) with 25mm thread objectives pictured. Not "total false advertising" but partially yes. So they don't actually say CFI on them? Take a look at the former page of the same forum topic: Rik explains the differences between CFI BE and CFI 60 series and recommends this very same objective to you. I see that I was upset about nothing. I was just shocked when I saw the pictures that were clearly the wrong ones. 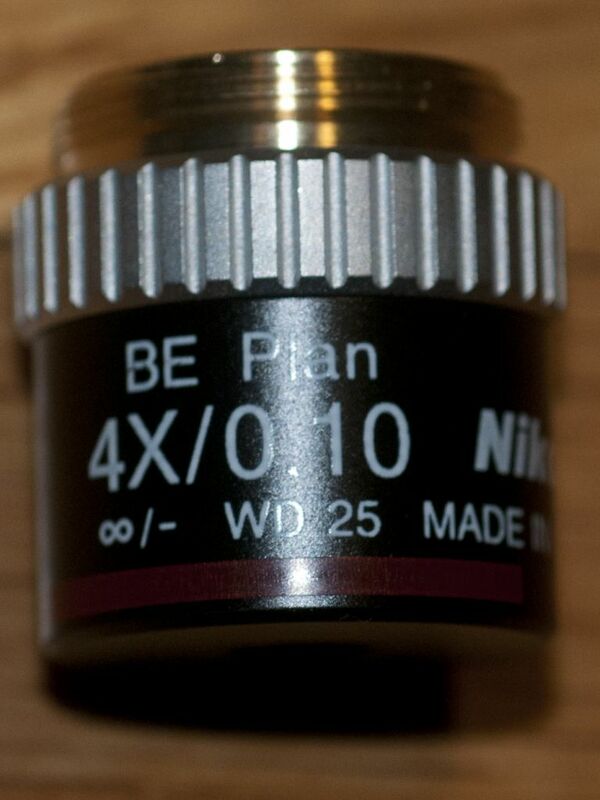 The incorrect appearance of objectives shown at http://www.opticsplanet.com/nikon-cfi-be-plan-achromat-eyepieces-for-microscopes.html is a longstanding problem. Long ago I emailed to the company to let them know about it, but nothing happened. If you look at the URL, it's even more strange -- these devices are objectives, not eyepieces! Without intending to be too snarky, it seems clear to me that whoever manages the opticsplanet.com website is not what you'd call "detail-oriented". However, Optics Planet does seem to do a good job of delivering objectives, so I keep recommending them. Sometimes I remember to explicitly warn about the bad photo when I make the reference. Other times I guess I implicitly rely on the warnings I wrote in the two reviews I always point to, at http://www.photomacrography.net/forum/viewtopic.php?p=101380#101380 and http://www.photomacrography.net/forum/viewtopic.php?t=16348.